Modeling multiplication of integers with number counters is the goal of this lesson. 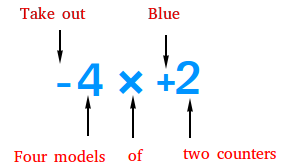 For some of the models, you will see how the concept of repeated addition can be used to do the modeling. 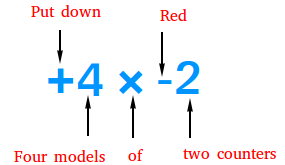 For example, the meaning of +3 × +2 is to put three models of 2 down. Since there are 6 blue counters now and they are all positive, the answer is + 6. How about +4 × -2 ? Well, it means to put down four models of negative two. 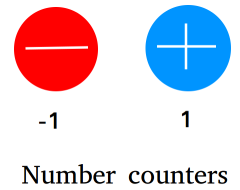 Since there are 8 red counters now and they are all negative, the answer is - 8. In some cases, as opposed to adding counters, you will need to take out some counters. For example, how do we model -4 × + 2 ? 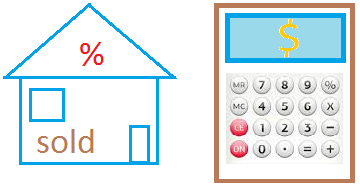 This one is a tricky math problem! First, you need to understand the meaning of -4 × + 2. 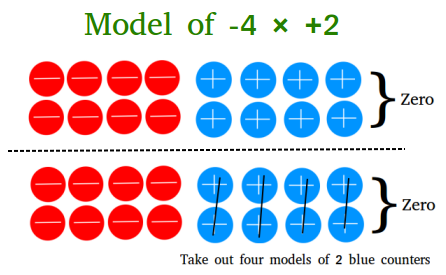 As you can see in the illustration below, it means to take out four models of 2 (or take out four models of two blue counters). So far though you do not have any blue counters to take. Therefore, you need to put it down. The way you do that is by putting a zero down. The zero will have 8 blue counters and 8 red counters. Notice that by putting a zero down, you are not changing the problem since a zero is nothing. After removing the 8 blue counters, you are left with 8 red counters. The answer is -8.